A few weeks ago, a man in Winnetka, Illinois filed a lawsuit against a national coffee and tea chain, Peet’s Coffee & Tea, alleging he has been cheated for the past five years. Specifically, he claims the amount of coffee he’s been served versus the amount of coffee advertised (and for which he’s paid) are different—he’s gotten less than promised—of course. And now he’s going to do something about it. He’s waited five years to say something and this is how he does it? Ok—where do you start? Well, let’s try the facts—which shouldn’t take long. On October 29, Robert Garret’s attorney, Alexander Loftus, filed a complaint on behalf of his client and presumable “others similarly situated”, in Cook County Circuit Court against Peet’s, which is based in Emerysville, California. The Peet’s lawsuit claims that for several years now the company has shorted its customers on the amount of coffee they receive when ordering either 12-ounce or 32-ounce cups of Peet’s Press Pot coffee. A 32 oz cup of coffee? Seriously? Why not just get an enema? To put this in perspective for all of you Starbucks folks, that’s like downing a Venti coffee and then ordering another Tall one for the road. I digress. Back to the facts, such as they are. According to the complaint, the menu board at the coffeehouses state those sizes, and customers may believe they are paying for those sizes. BUT, “in fact,” they receive significantly less coffee. For instance, the complaint asserted the largest cup in which beverages are sold at Peet’s can only hold 24 ounces of coffee. “Only”? “In truth, they are at least 25 percent less than the advertised volume,” Garrett’s complaint stated. He’s certainly observant. The complaint goes on, no surprise, to state that the volumes referenced on the menu board may actually refer to the size of the French press devices in which the coffee is steeped. BUT, the complaint states that by referencing the volumes on the menu board, Peet’s intended to fool customers into believing they are actually receiving that much coffee. “Defendants (Peet’s) have engaged in conduct designed to induce, or having the affect (sic) of inducing, consumers to believe that they are receiving materially more ounces of press coffee for their money than they actually are,” the complaint said. Conversely, getting the full 32 oz of coffee could surely induce a few things as well, but clearly Garrett is willing to accept any side effects there. Garrett claims that the French Press coffee is the only beverage Peet’s sells by specific volume. Everything else is sold by general sizes such as small, medium and large. 32 ounces would, I feel safe in saying, constitute super-sized large. In fact, it’s up there in Big Gulp territory (quick factoid: the original BG debuted at 32 oz back in 1976). FYI—Garrett states that he buys his Peet’s coffee at the chain’s store at 817 Elm Street, Winnetka. (Is there no store manager he could have spoken with about this?) He believes there are thousands of others who ordered Peet’s Press Pot coffee at the chain’s nearly 250 locations nationwide who could join his lawsuit, should the court allow it to proceed as a class action. Well, it is a pressing matter—ha ha—pardon the pun but I couldn’t resist. According to the potential class action, Peet’s actions have violated state consumer fraud laws, and constituted breach of contract and unjust enrichment. Garrett has asked the court to award unspecified compensatory damages and fees for himself and other members of the putative class. Not happy with State Law? Create your own Republic instead! Such as in Texas. Bit of a history lesson here. Prior to Texas being annexed to United States, it was The Republic of Texas—its own country for a decade, between 1836 and 1846. Today, there are still some hold outs—including Susan Cammack, a single mother, a pleasant person, by all accounts, who considers herself a “Texian”—that is—a citizen of the Republic of Texas, and not the United States. (Wonder if she has a passport?) Never mind that she wasn’t actually alive to be a part of the actual Republic of Texas—she’s still living the dream. So long as everyone stays out of trouble—no problem. But, when you start serving legal documents from your “sovereign nation” on a judge and lawyer, ordering them to appear before an “international common law court,” people may not take kindly to it, in fact they will probably decide to play by their rules and have you arrested—if they don’t contact the local psychiatric services folks first. And that is precisely what happened to Susan—the legal authorities were brought in. The back story? Ms. Cammack was the subject of foreclosure proceedings. So she had a Houston-area chiropractor and the Republic’s chief justice, David Kroupa (oh yes—and why not?) issue a writ of mandamus and quo warrant to state District Judge Rex Emerson who was presiding over the case, and a subpoena to the attorney representing a title company, Bill Arnold. They were most seriously unimpressed. So, in February, Cammack was arrested during a raid on a Republic meeting in a VFW hall. Ok—wait—just pause to ponder that one: would Texians who are by default not Texans and, therefore, not part of the Union, be drafted for a foreign war? Do the Texians have their own military? But I digress…back to the raid… The raid, in fact, involved authorities representing the local sheriff’s office, FBI and other agencies and they seized computers, phones and other material from about 20 people participating in the meeting. Whoa Nelly!—the powers that be were in “take no prisoners” mode! As for Kroupa/chief justice/chiropractor? He pled guilty to a misdemeanor and testified against Cammack at a legitimate trial in the State of Texas. Hey, loyalty to the Republic and fellow Texians apparently only goes so far. 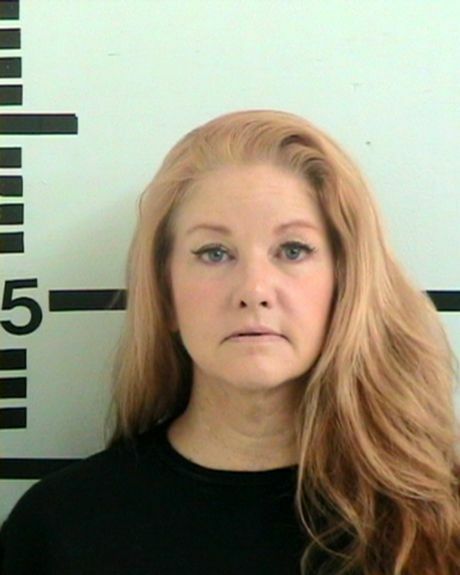 Cammack was convicted of three misdemeanor charges–for simulating legal process—ouch!—for which she must pay a $500 fine and serve two years probation. Well, that certainly worked out well. Not. Cammack says she will appeal her conviction: “I believe my good name has been besmirched … my inalienable rights have been trampled on by the system.” Trampled on by the Republic’s system, I would say. She better hire a lawyer who practices state law, as in Texan law, I would say. It’s akin to being struck by lightning—only this man was struck by a 16 lb pine cone while catching a few zzz’s under a tree in a national park. Needless to say, he was injured, seriously, and is now suing the US government, the National Park Service and the San Francisco Maritime National Historic Park. And no, I am not making this up. Sean Mace, a US Navy veteran in his 50s, went to the San Francisco Maritime National Historical Park at the Fort Mason Center on October 12, 2014, to find a spot to watch the Blue Angels air show. 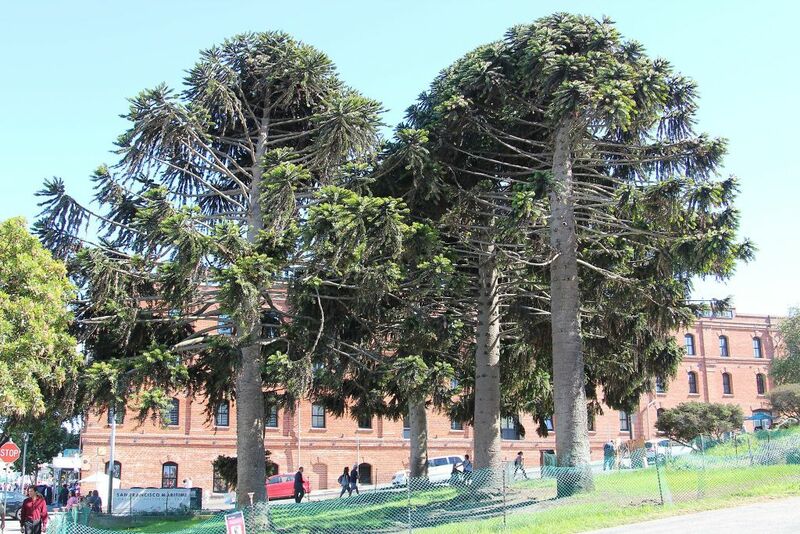 He found what he thought was a peaceful place to read and rest in the northeast corner of the park under a stand of coniferous Araucaria bidwillii trees, more commonly known as bunya pines or false monkey puzzle trees (first clue), according to the lawsuit. Mace, having apparently determined there was no imminent danger—more on that in a bit—had a little nap under the bidwillii tree, as one does on a nice day. Little did he know the flora and fauna had other plans. I know you’re not supposed to sit under coconut palms because falling coconuts could kill you. But pine cones? Well, to be clear, the Bunya pine is not indigenous to the area, the lawsuit notes, and the trees in question are thought to have been planted by park staff years ago. Their seedpods can grow to—are you sitting down?—as much as 16 inches in diameter and 40 pounds in weight. O.M.G. And is if that weren’t bad enough, they are covered in sharp, spiky needles. So the one that landed on Mace’s head was a mere infant, from the sounds of it. Somebody must have seen what happened because he was rushed to San Francisco General Hospital, according to the court documents, where he underwent surgery to relieve pressure on the brain from internal bleeding. Likely not the afternoon he had planned. Worse still, Mace required another two brain surgeries as a result of the injury and has also suffered severe and likely irreversible cognitive defects, according to Scott Johnson, the San Francisco attorney representing Mace. “He’s afraid to go outside at this point because he’s afraid something is going to hit him in the head,” Johnson said. “Our priority is to institute change and help this guy out.” According to Johnson, Mace has been so severely affected by the incident and now suffers from post-traumatic stress disorder and depression (PTSD). So what’s to be done about Mother Nature’s apparent wonton disregard for visitors? Signage baby!! 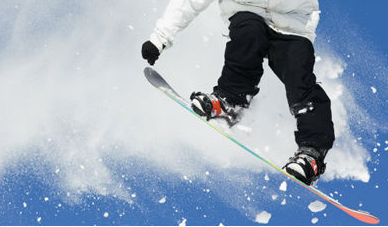 Hey—knowledge is power—and if reading a sign helps others avoid this type of injury—bring it on. Oh—wait—the signage should have been in place already. According to Mace’s lawsuit, when he visited the national park last year, there were no warning signs about falling seed pods. The giant pine cone that clobbered him fell from a non-native tree planted by park authorities, and so park policy stipulates that exotic species that create safety hazards should be removed, and if they’re not removed, fences, netting, or signage should be put in place to warn of the dangers. According to a report in the SFGate, these safeguards have been implemented, and the new signs read, “Danger — Giant seed pod falling from tree.” (Grammatically, that could present a problem.) Orange fences have also been erected around the tree grove. But—yup—there’s a but—the fences and signs may not do the job. According to local street artist, Joe Barlow, who paints near the grove, the cones fall dangerously close to tourists. Barlow said he’s seen the cones fall from branches that hang over the sidewalk outside of the fencing. “And it’s not just the size of them either. They’re big, but they’re really heavy and they have these spikes on the outside like a pineapple,” Barlow told SFGate. So, not something to pick up in your local garden center then. Moral of the story—if you’re planning on taking a nap under a tree—look up first. Is Farting Protected Under ADA? Guess we’ll be finding out. 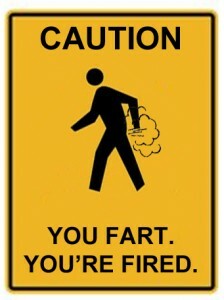 Yep—we finally have a farting employee lawsuit. But what about opera singer Amy Herbst, you say? (A precedent!) Yes, true, she was a farting plaintiff as well—but she didn’t get fired. This guy got fired. So…is it a lot of hot air about nothing? No actually. At least not from the sound of it. This poor guy lost his job because he couldn’t stop farting, and so he did what any self-respecting person would do—he’s sued is ex-employer. And, in a show of solidarity, so has his wife—they both worked for the same company—a New Jersey pork roll maker. Let’s just skip the obvious puns here. So the back story on this is, of course, rational. Richard Clem worked as a comptroller at Case Pork Roll Co. Before the random and fairly continuous farting developed, he was obese—having reached as much as 420 pounds. In an effort to remedy this situation he underwent gastric bypass surgery in 2010. So far, so good? Nope, afraid not. According to his lawsuit, he is suffering from constant flatulence as a side effect of the surgery. Fantastic! According to his wife’s lawsuit, Louann’s husband experiences “extreme gas and uncontrollable diarrhea” that Richard himself said made him have to “sit on a toilet 24 hours a day.” Nice. Thanks for sharing. That’s gotta put a serious kink in any plans you have—and test your relationships. “I couldn’t go out anywhere, go to the movies, to the market, you name it, without having to look for a bathroom everywhere I went.” You think? It’s bad enough when you get the occasional episode on the bus or in a movie theater but—any place, any time? All the time? I’d be suing the surgeon. Now—Richard is 70 years old. He admits that his condition puts him under constant stress and mental anguish since he “couldn’t control” his “very embarrassing” issue. “Some people think it’s funny but if you have to live with my condition it’s not very funny at all,” he told The New York Post. Yes—thinking about it for even half a minute gets tediously depressing, never mind living with it. According to my trusty source, The NY Post, Dolan allegedly told Louann that “This can’t go on. We can’t run an office and have visitors with the odor in the office,” and “We have to do something about Rich,” the lawsuit apparently states. When Richard attempted to explain to Dolan that his breaking wind was simply a side effect of his surgery, Dolan told him, “Oh I don’t believe that, there’s gotta be something wrong with you,” Richard said. Well, yes, actually, there is something wrong with him—it’s medical and perhaps a medical solution should be sought? More on that in a minute. 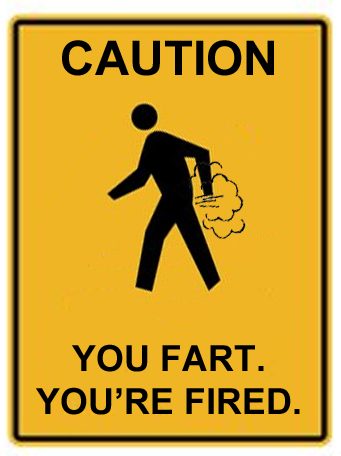 So, on February 28, 2014 Richard let out his last fart on Case territory—he was fired. The same day his wife quit Case due to all the negativity directed toward her husband. And they lawyered up. David M. Koller, the Clem’s attorney, said he is proud of the couple. “I’m proud of my clients for being brave enough to discuss something that is personal and perhaps embarrassing and they are looking forward to the court process and will accept the results of the judicial process,” Koller said. Richard Clem is looking for the value of three weeks paid vacation and two years’ salary which he believes will total about $250,000. The Clems are suing under the federal Americans with Disabilities Act and the state Law Against Discrimination because of her association with her husband, who was 420 pounds and had an obesity disability, according to the lawsuit. A post script here—since being fired, Richard Clem claims to have acquired the ability to control his gas, about 90 percent of the time, by taking medications that cause him to become constipated. Oh—that’s good. Let’s hope that doesn’t backfire. Pardon the pun.